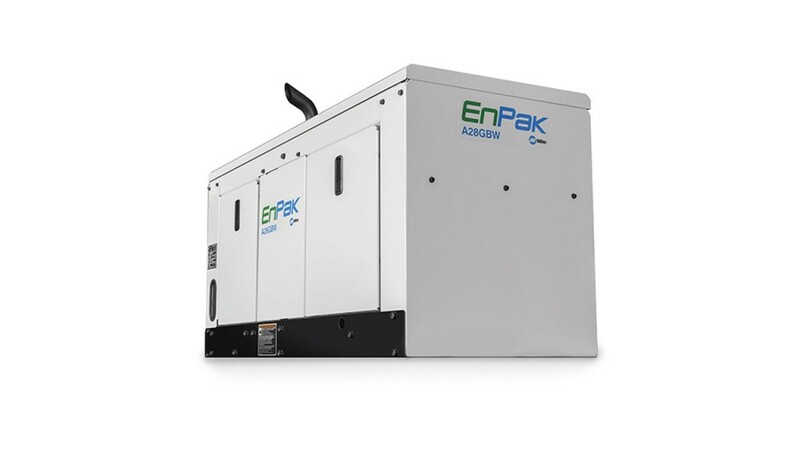 Service technicians can turn their trucks off and use the EnPak A28 to get virtually any job done in the field, saving on costly fuel and maintenance expenses associated with running a Tier 4-compliant truck engine. 28 cfm compressed air: Virtually any tool can be powered by the industrial grade rotary-screw compressor. Electric power: A 5,500-watt generator lets users power jobsite tools and even operate truck-mounted electric/hydraulic cranes. Battery charge/crank assist: Delivers up to 100 amps of DC power for 12V/24V battery charging and up to 300 amps for crank assist. Welding capability: Field repairs can be completed with the versatile 210-amp stick welder; the EnPak A28 is the first EnPak to include built-in weld functionality. Remote panel with simple, straightforward controls: Eliminates the need for technicians to climb into the truck bed to start and operate the unit, saving time and reducing risk of injury. Fully enclosed compact case: The EnPak A28’s small footprint (45 inches long, 20 inches wide and 24 inches tall) provides more space for tools and service parts. It also saves up to 550 pounds compared to using a PTO-driven air compressor and engine-driven welder/generator onboard. Fully enclosed, corrosion-resistant case provides industrial quality for professional-level reliability, capability and appearance.